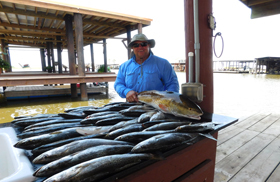 Today is July the first and we are still catching beautiful speckled trout on the south side of Barataria Bay. I had a group of guys in today from the east bank of New Orleans Louisiana and they were ready to catch some fish. 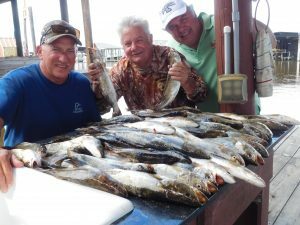 We left this morning and headed south towards Barataria Bay with four hundred live shrimp in the live well and a truck load of anticipation that we were going to have a great day on the water. We had a slight wind out of the southwest at about seven miles per hour. The wind ended up calming down to around four miles per hour by eight o’clock. When we arrived on the south side of Barataria Bay early this morning I found the water to be very clean and the surf was not pounding. All the conditions were in our favor. Well it look like we were going to pull one of those one stop shops, but mother nature had something else in mind for us today and it was not to finish up early and come home like we through we would. We bounce around catching a few here and a few there as the morning unfolded. I guess it was about eight thirty when the tide changed and started to fall is when we pulled up to a sunken island east of quarter bayou pass that we found a pretty good bite. 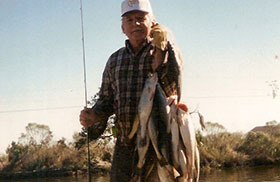 The trout we were catching was all sixteen to eighteen inch trout and we did not have to measure any of them. Of course all fish were caught on live shrimp three feet under a popping cork. The guys were having a great time when all of a sudden one of there lines took off like a house of fire and was headed straight towards the gulf of mexico. 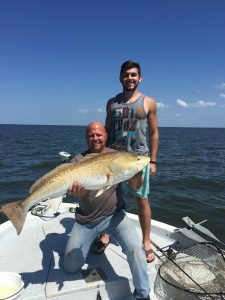 The guy that hung in to the bull red was a doctor from the city of New Orleans and had never caught a big red before in his life. Well I think you know how this story ended up thirty minuets latter. 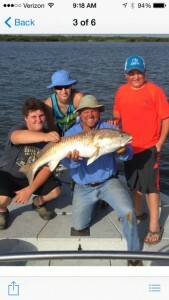 He was so proud of that bull red. We must have taken at least fifteen photo’s of him and that fish before we threw it back in to the water. I made sure the bull red was breathing good before I let him go to fight another day. One of the factors that was against us today was the .4 tents of a tidal range. Anytime the tide gets lest then .5 tents of a range it makes for some tough fishing. Today we had to find some good points to fish because the sunken islands I been catching fish at simply did not have enough tide going over them to support any fish. We didn’t have to worry about the wind today but the heat and the tide was two factors we had to deal with. Remember you have to try and over come the adversities while on the water. There will always be something out there that you will have to compensate for while on the water looking for a bite. It’s very seldom that you will go out and not have to over come some kind of adversity while on the water. Anyhow we got back to the village with a box of beautiful speckled trout and did our normal post fishing trip chores. I had lots of help for the fellows so it didn’t take too long to get both the boat and the fish cleaned up and packed away for the ride home. The guys were looking forward to a good fish fry for there families tonight. They were calling there wives and telling them what to go to the store and get so they would have everything they needed to prepare dinner. You here me say this all the time about building memories while on a fishing trip. 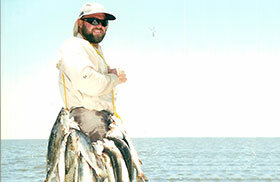 Truly I can say that catching a box of speckled trout is only half the fun. The best part is all the stories and good times that we have while on the water catching them fish. Each one of those guys are going to go home and tell there wives and children as well as there friends all about the day on the water. 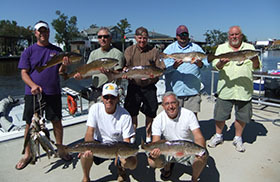 The speckled trout fishing trip was over by eleven o’clock today but the memories will last a live time. All fore log cabins are full of families this weekend with it being the fourth of July weekend. I can see the dad’s are lighting up the BB pits while the mom’s are watching the kids jump into the bayou. I keep waiting for the kids to get out of the water and get something to eat, but there mom’s are telling them that if they get out and eat they will have to wait one hour before they can get back into the water. Well there mom should have never told them that because they have been swimming all day. I think there mom’s are going to ware out before the kids do. I bet you one thing, when tonight rolls around no body is going to have to tell those kids to go to bed tonight. With it being a long weekend I am sure they will be right back at it in the morning. 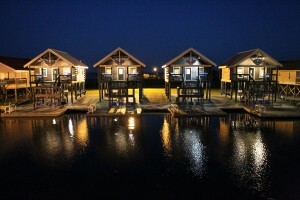 Spending time at the camp on the bayou is some of my best childhood memories. I am sure these kids will remember this weekend for the res of there lives. It is sometime amassing to me how so many kids are missing out on all the fun with playing outdoors today. I think the parents should force them to get out of the house and make them to do some fun things such as going to the camp and seeing all the many things to do. I am sure if they would experience a weekend at the camp having fun like these kids are doing this weekend they would like it as well.